All of our staff participate in an intensive week-long training program and are certified in First Aid and CPR. Our pool and lake staff are American Red Cross certified lifeguards and our program specialists are trained and certified in their program areas. In 2013 Camp Wise built a state-of-the-art Health Center equipped with two exam rooms, a “walk-through” space for efficient medication distribution, and isolated rest and recovery areas for campers who are feeling under the weather. The infirmary is staffed with 3 nurses to provide around the clock care. An Infirmary Manager keeps a log of all visits to the infirmary and ensures that parents are kept in the loop about their camper’s care. Volunteer doctors are always on-call, and visit camp 2-3 times each week for campers who require additional medical attention. Camp Wise is located just around the corner from University Hospitals Geauga Medical Center and Emergency Room. 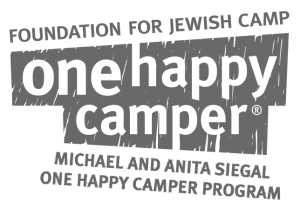 Our medical team has partnered with local Dentists, Ophthalmologists, and Orthodontists should a camper need a special appointment. Our Executive Chef and a team of 20 staff ensure we can easily accommodate a variety of dietary preferences and food allergies. The kitchen takes the time and care to prepare separate, alternative meals to accommodate vegetarian and vegan diets, gluten intolerance, fructose intolerance, lactose intolerance, celiacs disease, dairy allergies, and egg allergies. To accommodate a growing number of nut allergies Camp Wise does not serve nut products or products made in a facility that also processes nuts. 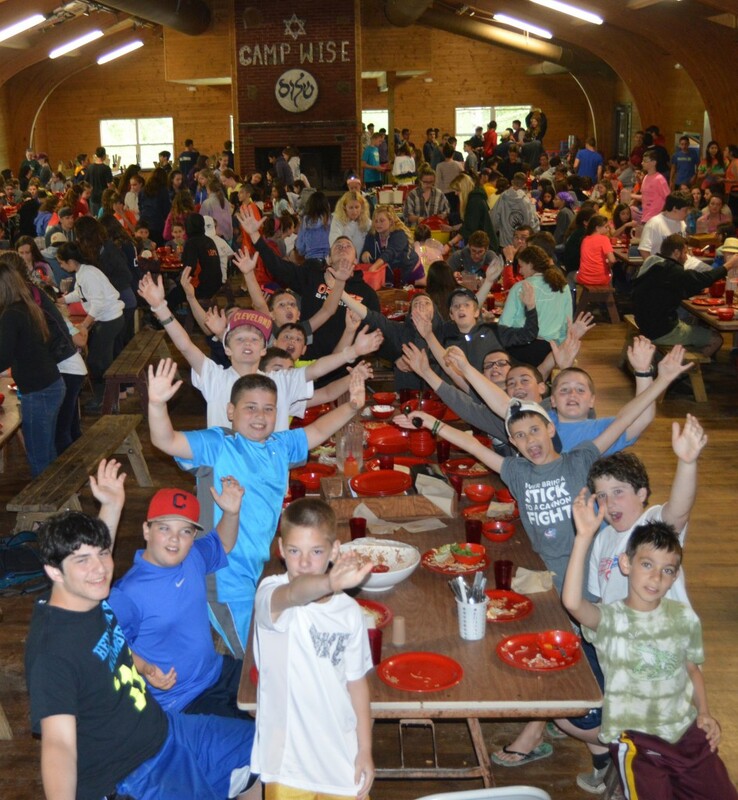 At Camp Wise, we understand that children are at varying developmental stages and have different needs while at camp. With that in mind, campers live in a cabin with other campers in their school-grade. Cabins all have three or four staff members, keeping the cabins below a 1:4 ratio, and allowing staff to build meaningful relationships with campers. For more information please see our camp life page. Every morning village supervisors meet with the Director, the Social Worker, and our Infirmary Manager to discuss each camper’s health and wellness, cabin dynamic, and socialization. Inspired by the use of Individualized Education Plans (IEPs) in schools, this new tool is specifically designed for campers who may need additional support during the summer. Camp Wise staff, including a CW administrator and Social Worker, collaborate with parents and campers prior to the summer to write a plan for camper success. Campers who use the CSPs will also meet with an Assistant Director, Camp Social Worker, or Camper Care Specialist as needed to scaffold their ultimate success throughout the summer. Villages are supervised by experienced staff over 21 who each mentor 4-5 cabin counselor teams on how to best care for the kids in their cabins. Every morning village supervisors meet with a Camp Wise Assistant Director, the Camp Wise Social Worker, and our Infirmary Manager in order to discuss the success and challenges of each camper in the cabin. This way our professional staff can help provide strategies for success within a thriving cabin dynamic. 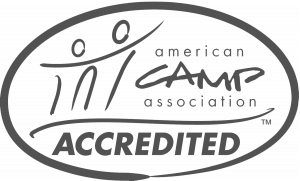 This also gives our staff a direct channel to voice any concerns, be on the same page about health issues, and keep our camper care program running cohesively. We ask you and your camper(s) to provide us with a lot of information prior to camp. This includes a confidential camper questionnaire, first time camper do-it-yourself questionnaire, and returning camper questionnaire. We use this information—coming from multiple perspectives–to prepare your child’s counselors to best care for your camper as an individual. Special attention is paid to behavior management tips, camper’s adjustment to overnight camp, social history, and the camper’s hopes for the summer. We never share private family information, camper’s medical needs, or mental health diagnoses without consent from parents. 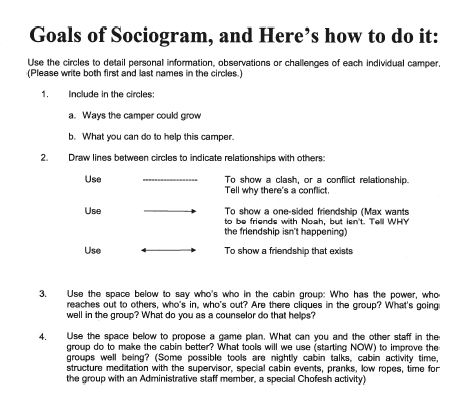 Camp Wise was an early adopter of sociograms, a tool that allows counselors to visually map cabin dynamics and friendships. 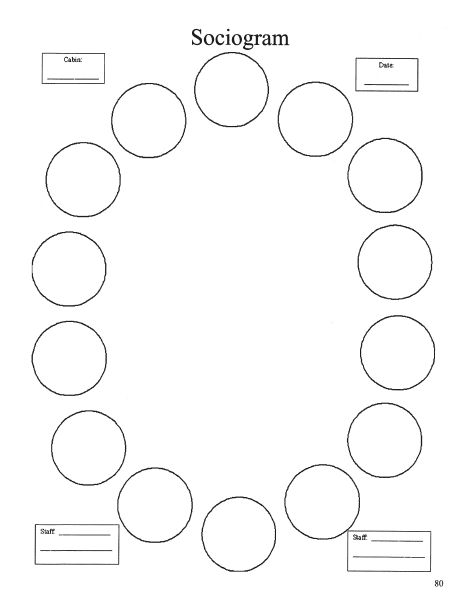 This tool identifies friendship groups and provides the staff data to help nurture camper growth and provide engaging activities to best support the development of the cabin group. 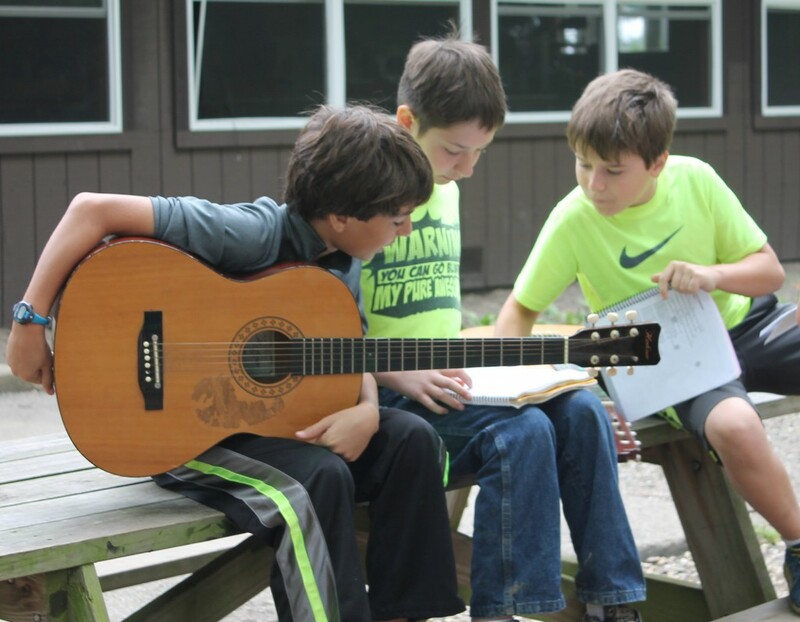 Sociograms are completed by your child’s cabin counselor team early in the session, and revisited frequently. Sociograms allow our village supervisors to monitor the growth and changing dynamics of cabins over the course of a session in order to best mentor cabin staff on how to support their cabins.